Lady's Folding Fan from the collections of the Worthington Historical Society (WHS) may be used for educational purposes as long as it is not altered in any way and proper credit is given: "Courtesy of the Worthington Historical Society, Worthington, OH." Prior written permission of the WHS is required for any other use of Lady's Folding Fan. Contact WHS at info@worthingtonhistory.org to request permission. Lady's Folding Fan is realia, with genre accessories (clothing & dress). This fan belonged to Crissa Maynard, relative of prominent Worthington businessman Orange Johnson. This fan of French design measures 10 inches in diameter and is constructed of paper and wood. 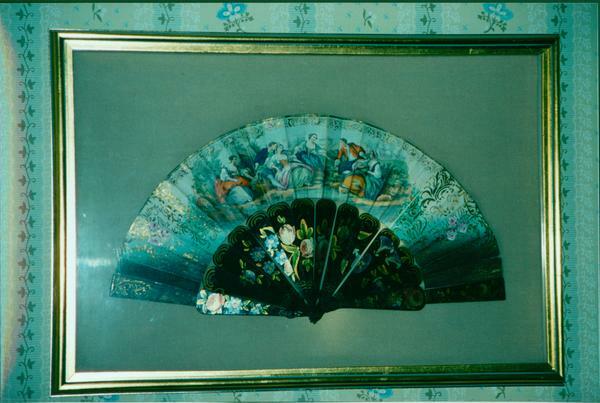 Painted fans such as this one were popular in the 19th century and were important accessories for women. Fans sent social signals by the way they were held and positioned. Fans have been used around the world for hundreds of years to create an artificial breeze in order to keep cool. The first folding fans were probably invented in Japan around A. D. 700. The Worthington Memory identification code is whs0023.